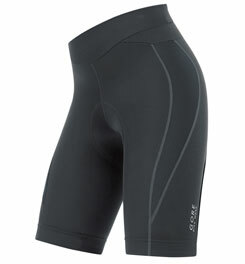 Bike shorts are a piece of gear that you should not skimp on. Your most delicate flesh is at stake – treat it well! I generally believe that when it comes to bike shorts, you get what you pay for and the cheap ones are just not worth it. Gore is not cheap but not extremely spendy either, so it’s a great option considering the shorts are super high quality, on par with Rapha if you ask my delicate bits. I really like the chamois; it seems to have more padding than most and doesn’t chafe as much as other chamois. I tend to have problems with chafing so I have promoted these shorts to the top of the pile, as much because of the fit and material as the chamois. The material is super awesome, matte-ish spandex without the ugly shine and without the squeeze factor. It’s very soft and silky feeling without being slippery. I live in fear of snags in beautiful fabric like this, so if you want to keep these shorts looking nice, keep velcro well away from them! I have to hand it to Cynthia from Gore who sized these shorts for me – I usually wear a small so at first I was a tad affronted when I saw the L on the label…but Cynthia assured me that the sizing was a little off and she was right; they fit perfectly. I’d recommend sizing up at least one size in these shorts. I really love that I can’t feel the silicone grippers. I usually dislike grippers but these are really unobtrusive. The waistband is wide and comfortable with no drawstring, which I really like as well. Comfort is the deciding factor in making these shorts a real winner – you can hardly tell you’re wearing weird diaper-like bike shorts. All in all, a super comfortable short at a reasonable price.